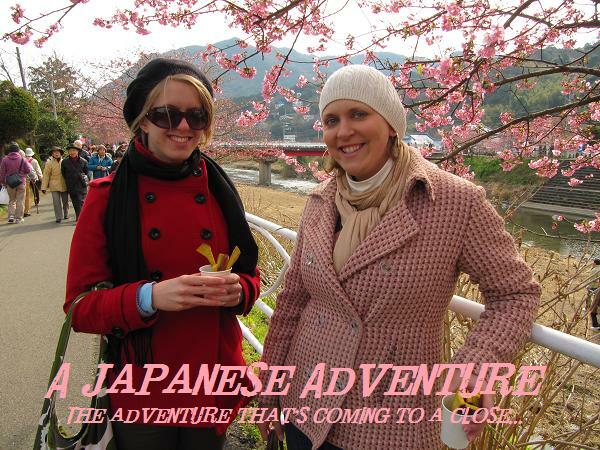 Anyway, here's a pic of us with the torii tunnel behind us. Though the shrine it'self wasn't all that cool, there was an important holiday here recently called the Seven-Five-Three Festival. People celebrate their 3 year old and 7 year old daughters and 5 year old boys. They bring them to shrines or temples to pray for their health and happiness. Below is a little girl I'm assuming turned 3 this year. It's too cute when even Japanese this young are already flashing the peace sign! Love it. And as with all shrines, we had to take a quick pic with the barrels of sake. Do you think they would notice if one of those things was missing? I'm sure Buddha would and I would live with bad karma forever! I'll keep my klepto tendencies to a minimum while at shrines and temples. Next we were off to Imperial Palace and Gardens. Not my first visit, but beautiful nonetheless. Imperial Gardens is actually one of my favorite places in Japan. It's so peaceful. It was extra special this time because of all the fall colors. The pond and bridge in the garden. Posing at a lookout above the gardens. After a long morning and early afternoon of walking, we needed to rest our feet! We stopped in for some Chinese ramen and a beer before continuing on! Last we stopped off at the Tokyo Metropolitan Government Building for a night view of Tokyo. The city lights never end. After that, we seriously couldn't walk any further!! Our feet were killing us, so we headed back to the hotel for a rest! Our hotel room was super small, but it got the job done. After resting up for a bit, we made one more venture out to see Sensoji Temple, with the huge lantern that's lit up at night and the huge five story pagoda. I have posted pics of that several times, so I'm going to opt against adding anymore photos to this post!! I already have too many! It was a great day, with the highlight definitely being the gardens and fall colors.